Last Sunday, my parents had to go out in the morning and decided to buy lunch for the folks at home from Kebab Street. It turned out to be just perfect, that they went back and had food there for dinner too, and bought some for the lazy ones at home. And on Monday, a bunch of us from CFG went there for dinner and so, I have had three meals in two days from Kebab Street. It's just the place for simple nice kebabs and not too fancy of anything. The ambiance is that of a small eat out, you place your order at the counter and they deliver it to the table. Since I had so much on Sunday, lots of the food were repetitive for me on Monday, but not the schwarma. Kebab street had just the right ratio of meat and veggies in their schawarma, what kills the almost perfect dish is that it is stuffed in roti instead of pita bread, but if you do not care, this is good schawarma. 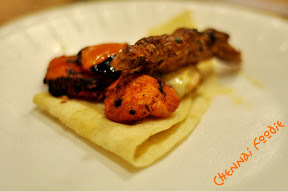 We had some great fish tikka at home and very nice albeit thin sheekh kebabs that were both nice. At the restaurant, I really liked the tandoori stuffed aloo, which is stuffed with beet root or carrot stuffing, and the cheesy malai kebab was also very nice. The stuffed tangdi kebab could have been a great dish, but the focus was so much on the stuffing that the real tangdi had something grossly missing. Mom had brought home some very nice jeera pulao and butter chicken which all of us at home enjoyed, so I did not stuff myself again at the bloggers meet. 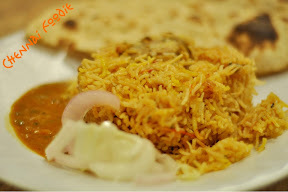 Biriyani is just about average and I would prefer the jeera rice, but if you need more rice options, biriyani is available and as the owner puts it, it was added to the menu because almost everyone requested it. Not too many options for dessert, we had the only one that was available, I forgot its name and it was very typical of a kebab restaurant. 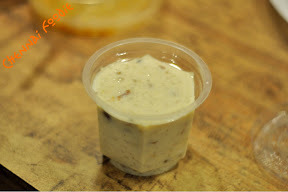 Lassi is available in plain and rose flavors and will probably do good for the summer lunches. First two meals were packed and eaten at home and the next was at a food bloggers meet with the owner around, so can't comment on the service. Prices are quite competitive and a meal for two should cost about Rs. 600 or so. 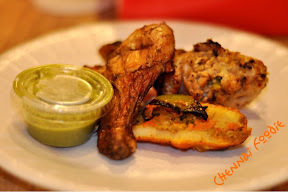 Kebab street is located on Landon's road, Kilpauk. It's the road at the dead end when you take the road right next Ega theater.